The new Kia Picanto has gone on sale in the UK, priced from £9,450 on the road. Its dinky dimensions remain virtually unchanged, but the third-generation city car now comes with five doors and five seats as standard, making entry and access much more accommodating and comfortable for rear passengers. Buyers will be able to choose from a range of two petrol engines: a three-cylinder 66bhp one-litre unit and a four-pot 83bhp 1.25-litre engine. A new one-litre three-cylinder unit with 99bhp will make it three before the end of 2017. Each engine comes linked to a five-speed manual gearbox as standard, but a four-speed automatic is also available with the 1.25 engine. Fleets and fuel-conscious drivers will be pleased to learn that, on a combined cycle, the entry-level single-litre engine returns 64.2mpg, emitting just 101g/km of CO2. 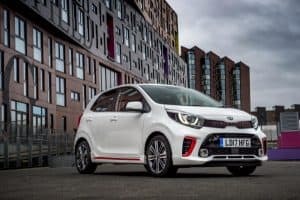 Underpinning the new Picanto is Kia’s new H platform, which uses twice as much high-strength steel as the previous model, up from 22 per cent to 44. This means the car’s shell is more robust and 23kg lighter. The car’s tighter body makes for a comfier ride and better handling, which in a city car are always welcome improvements. Equipment is split over three grades. Entry level ‘1’ models come with electric front windows, remote locking with a folding key, tinted windows, a stereo with AUX and USB ports, a tilt-adjustable steering column, automatic headlight control, electronic stability control, vehicle stability management, hill-start assist control and six airbags. Stepping up to grade ‘2’ sees the addition of manual air-con, electric windows in the rear, heated door mirrors, Bluetooth, leather-trimmed steering wheel, body coloured door handles, 14-inch alloy wheels instead of steel and four stereo speakers instead of two. Grade ‘3’ Picantos ride on 15-inch alloy wheels and receive autonomous emergency braking, electric folding mirrors, automatic air-con, cruise control, DAB radio with six speakers and a rear parking camera with sensors. Finally, GT-Line models [pictured] benefit from some fiercer styling with 16-inch alloys, sport bumpers at the front and back, dual exhaust, black and red faux leather seats and stainless steel pedals.